Antique Appraisals by Gannon's Antiques and Art are handled by professional antique appraisers on staff. We have been actively in business since 1998 appraising antiques and fine art. We research thousands of actual sold antiques and art to find the most accurate antique appraisal values possible. We have been appraising antiques and art professionally for many reasons including: estate liquidations, legal planning reasons, and to help our client's curiosity to know the value of their antiques and art. We offer appraisals on a very diverse variety of antiques and art. Our research to cover such a vast array of items comes from many sources including the daily experience we have gained by owning an multi dealer antique mall for well over a decade, from carefully monitoring auction house records world wide, reviewing many online auctions, tapping into our extensive network of antique specialists, as well as traditional methods like maintaining a very large library and staying current with the latest antiques publications. An antique furniture appraisal can be a little overwhelming to most people. We offer antique furniture appraisals for our clients in our showroom or in their homes. We often meet with people right in their homes to appraise antique furniture and other large pieces. Click here to learn more about antique furniture appraisals! An antique china appraisal is one of the most requested we preform. These appraisals offer their own unique set of challenges. You must take into consideration the age, material, patterns, the item, and the condition. All of these factors matter greatly when determining the antique china value. Click here to learn more about antique china appraisals! An antique jewelry appraisal requires knowledge of antiques and many different types of precious and semi precious stones. The designer and rarity of a particular piece also comes into play. Jewelry is one of the most treasured items people bring to us to evaluate. It is interesting to examine as there are so many varieties and designs. An antique clock appraisal involves carefully analyzing the workings of a mechanical work of art. The clock case is examined separately from the works. Often times the maker of the wooden case was not the maker of the clock works. Running condition of the clock is important. Even if the case is beautiful, most people still expect a clock to tell time. There are hundreds of very specialized areas of collecting that our customers ask us about. Antique Chinese and antique Asian porcelain appraisals are often requested. As are antique Chinese jade and Asian ivory. The amount of knowledge and experience necessary to perform a competent antique appraisal is extensive. We appraise furniture from antique to modern. Our team of professional antiques appraisers can help you with furniture of any age. Operating out of our antiques mall in Fort Myers, FL we have seen all types of furniture and can help you with yours. The desk on the left is an antique Wooton Desk. This incredible antique desk appraised for over $10,000. Some other unique pieces we have had recently include an antique China cabinet pie safe with plenty of storage in great condition. There is also a Hoosier Cabinet just into our antiques mall from "Home Economist". Another unique piece we have is a Barrister Bookcase with glass doors measuring 3.5' tall and is 34" wide. We also provide antique China appraisals and showcase many pieces of fine antique china.The piece to left is an antique Fischer Budapest Jardiniere in great condition. This is just one of the pieces of we also have a huge assortment of fine antique China. Another rare piece is our Antique Meissen China shelf. 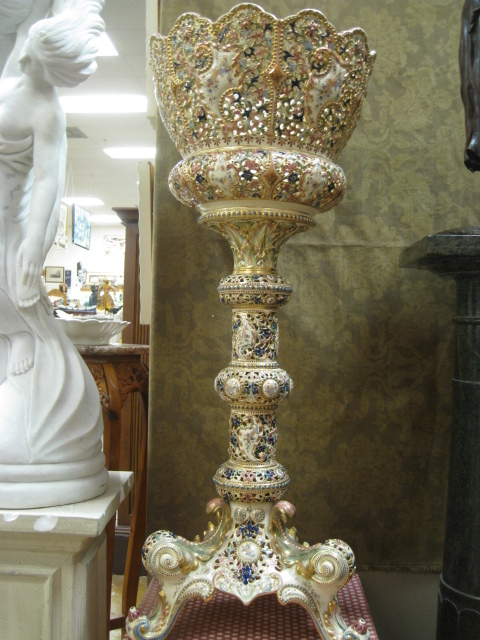 Its an incredibly detailed antique porcelain shelf with ornate flowers all over it. Our antiques mall features a large selection of antique jewelry and we offer free antique jewelry appraisals. We appraise all types of jewelry specializing in antique diamond jewelry, amber jewelry, antique gold jewelry, and more. Antique jewelry is the most common possession passed down from generation to generation. We can help you establish antique jewelry value in today's changing market. As active Florida antique jewelry buyers we are able to buy antique jewelry often. If we can help you with your vintage or antique jewelry please contact us. See also our vintage & antique jewelry. As Florida estate buyers we acquire vintage silver, antique silver, and silver flatware often. We buy silver and stay current with the ever changing silver values. Let us help you with your silver, we offer professional antique silver appraisals, we buy single rare silver pieces, and we buy silver flatware sets. 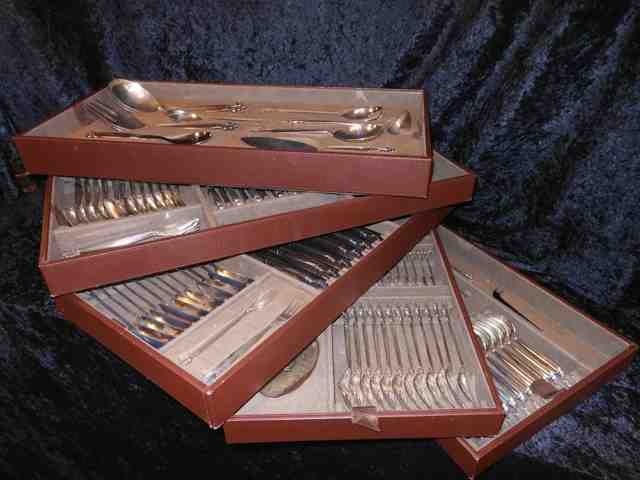 The set we have shown on the left is an amazing Georg Jensen Acanthus flatware set. It has an incredible 178 beautiful sterling silver pieces. See also our webpage Antique Silver. Antique Appraisal from Gannon's Antiques in Fort Myers. 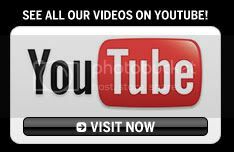 Go from Antique Appraisals to our Online Store! !